. . .dedicated to saving the art, and preserving the fun! 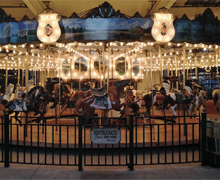 Historic Carousels, Inc., currently operates four beautifully restored antique carousels, a huge 90′ Ferris wheel, and an adorable little 20′ Ferris wheel in four locations along the Pacific Coast in California and Oregon. Historic Carousels, Inc., has developed its own operations and procedures, customer service handbook, maintenance and safety programs, and operator training program. All policies and programs exist within the strict guidelines of State regulations and OSHA laws. Our #1 priority is the safety of our guests as they delight in the enchanting experience of riding on an antique work of art dating back 100+ years. Located in Clackamas Town Center food court. Enjoy rides on a Chance Mfg. 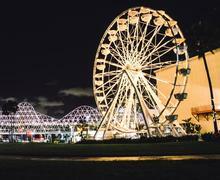 carousel and the Little Eli 20′ Ferris wheel. 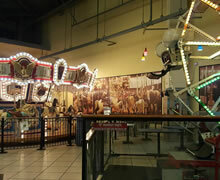 Our 1920 Herschell Spillman Carousel and 90′ Giant Wheel have been home to the Long Beach Pike’s harbor view outlet mall since 2005. The Fair Park Carousel was built by Charles D. Looff in 1895 and had its debut in 1904 in Dallas, Texas. It has been operating in San Diego since 2004. 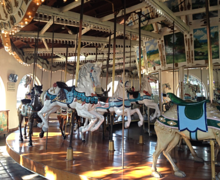 This 1916 Allan Herschell Carousel has been operating in the scenic waterfront views of Chase Palm Park in Santa Barbara, CA since 1999.